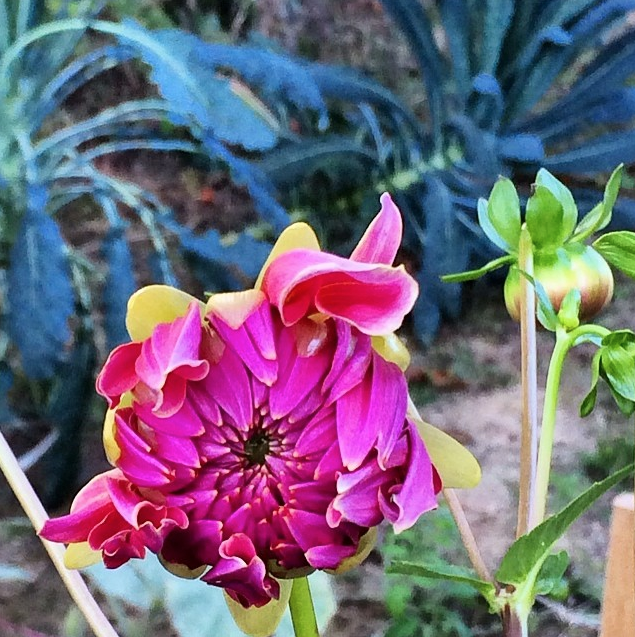 My Aunt Ruthie gave me a tuber last spring which produced the beautiful pink dahlia above. Knowing that dahlias require special handling, like being dug up each fall and replanted after all danger of frost is past in the spring, I had never tried my hand at raising them. My aunt hoped that at least one of the two varieties she brought me (of the four kinds she plants) had come from my grandmother’s property many years earlier, so I was eager to grow these dahlias. We stored them over the winter and put them in the ground after the last frost. The leaves came quickly on one tuber, but the other, which had seemed by planting time lighter in weight and somewhat withered, never produced green shoots. Still, I was excited to see whether the pink or red variety had survived and what the flower would look like. I waited for buds all summer and into fall and, finally, several weeks ago, I noticed that tiny buds had begun to plump up. Earlier this week, one of the tight buds unfurled enough to catch a glimpse of pink, but the day-to-day unfolding has been painfully slow. My aunt is not on Facebook, but her daughters are, and they kindly have shown her the first bloom’s daily progress as posted on my Facebook page. Saturday the news came from my aunt by e-mail that the surviving dahlia likely is not one originally raised by my grandmother in southeastern Pennsylvania, so we will try again to find a way to get some of Grammy's tubers to Indiana. Sunday I learned, based on my aunt's scrutiny of the above photo, that the dahlia is from a neighbor's daughter and bears the name Otto's Thrill. Back at our home in the Chicago suburbs, we had many plants which had been transplanted from my grandmother's huge collection of flowers. None of them, unfortunately, came with us to South Bend and I have missed them in our gardens here. Why do I take joy in the possibility of growing flowers that belonged to my grandmother and have been passed on to me by her daughter, my mother's youngest sister? This aunt, always special to me, still lived at home with her parents when I was born. As I grew up, I remember her showing me her wallet, full of photos of high school friends. Some years later, I recall writing letters to her with white ink on red stationery after she married and moved out of town. I proudly held her firstborn when my family paid her and my uncle a visit. And I vividly recall the horror of her losing her youngest child the day her oldest child was married, a tragedy too huge to imagine, but one that I resonated with deeply as I also had experienced loss by that point in my life. Beyond appreciating Aunt Ruthie as the giver of these flowers, as I appreciate all my family, I love surrounding myself with connections that become daily reminders of the generations that preceded mine, particularly because I moved away from the part of the country where I was born and, since college, have not had the routine opportunity to spend time with my family of origin. But I feel in touch with family every time I sit on the reupholstered couch dating back to my parents' early marriage days, as I light the candles on the gate-leg table from my great-grandparents, as I eat from my mom and dad's wedding china, made in occupied Japan. The memories of Grammy's Christmas dinners flood back when I use the server from her dining room, which now resides in mine. I think of my mother's family when I spend time in our guest room, occupied by an oak bedroom suite from my grandparents' farmhouse, or when I admire the secretary in our living room bought by my parents at a great uncle's sale. A rocking chair from Jim's family, now located in our sunroom, and the small caned chairs scattered around the house bring back memories of his parents and the generations that went before them. I am pleased to live with reminders from both sides of our families; so many are no longer with us, but we remember them well for having passed down their faith to our generation. As we approach All Saints' Day at the start of next month, I look forward to recalling, between now and then, the many ways in which that great cloud of family witnesses continues to surround us from the balcony of heaven! What reminders of your family of faith surround you? Do physical reminders, like flowers and the belongings of earlier generations, help keep family connections alive for you? How do you stay connected to those who have gone before? What have they passed on to you for which you are grateful? What do you hope to pass on to the next generation?